– After James Ellsworth cost Dean Ambrose a chance at the WWE World Heavyweight Championship last week after Champion AJ Styles riled him up enough to attack him outside, we were left to wonder how they’d follow up. Would Ambrose pulverize Ellsworth? Ellsworth did a good job as he played a sympathetic pest who expressed sorrow towards Ambrose. The opening in-ring segment with Ellsworth, Styles and Ambrose (we’ll call them the “SmackDown Three”) was a good program advance. It was evident that Styles tried to use Ambrose to get under Ellsworth’s skin and get him to “join the dark side.” Ambrose surprisingly accepted the apology and we got the expected physicality as Styles stood tall to end things. – The backstage segment with SmackDown Live General Manager Daniel Bryan, Ambrose and Ellsworth set up the main event as Bryan booked “one last chance” for Ambrose where if he beat Styles, he’d become #1 Contender and told Ellsworth under no circumstances would he be allowed at ringside. Were we supposed to feel bad for Ellsworth? Yay, another Styles-Ambrose match? – The No Disqualification match between Randy Orton and Kane was the follow-up to Orton’s heel turn/subsequent joining of The Wyatt Family as he RKO’d Kane to seal the deal. Orton didn’t seem any different besides his hesitance to pose on the top rope. The match was short and unspectacular with hokey outside interference. To sum it up, Wyatt/Luke Harper helped Orton win as he got the RKO to end it. The post-match angle saw Orton shove Kane into a Sister Abigail. Yeah, this program’s a thing. We’re still waiting for Orton to pull the trigger on a ruse on Wyatt, but perhaps they’ve changed their minds. At the least, The Wyatt Family has a different dynamic with Orton in. If it helps, Orton did his pose to end things. – The Baron Corbin hype video was shot in black and white with clips of him angry in a cage and on the road on his motorcycle. The visuals were cool and they got over that he was a “Lone Wolf” as he mentioned that fans, friends and family only dragged him down. – The Nikki Bella/WWE SmackDown Women’s Champion Becky Lynch-Carmella/Alexa Bliss match was an easy way to advance the Bella-Carmella feud and hype the Bliss-Lynch Title match for next week in Glasgow, Scotland. The action wasn’t memorable, but we liked the finish since it played into both feuds. Lynch had Bliss pinned as Carmella had the Referee distracted. Bliss raked Lynch’s eyes and hit a DDT to pin the Champ afterwards. The post-match promo from the heel duo was well-done as they each sent messages to their opponents and to the Raw women that they’d face at Survivor Series. The only thing we weren’t crazy about was the “Wizard Of Oz” reference from Bliss, but that’s nit-picking. They should pair up Bliss/Carmella more often. 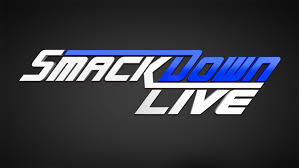 – The backstage segment with SmackDown Live Commissioner Shane McMahon, Bryan, Naomi and Natalya set more focus on the SD side of the SS women’s match. We learned that Bryan appointed Naomi as the final team member and after the request of Natalya (who quoted more songs), named her a “Coach.” She wanted to “turn kittens into lionesses.” Right. – The SS Tag Team Qualifying match between The Spirit Squad and American Alpha was a quick squash to easily put AA in their rightful spots. Spirit Squad remain purposeless beyond a foil for WWE Intercontinental Champion Dolph Ziggler. It would’ve been nice had it been explained this was a SS Qualifying match but that didn’t make it any less predictable. – The MizTV segment with The Miz, Maryse, Bryan and Ziggler continued this non-physical war of words between Miz and Bryan while we also saw Ziggler continue to remind Miz that he was a “fighting Champion.” The topic was SS, as Bryan revealed the SD Live team would be Orton/Wyatt/Ambrose/Corbin/Styles, as Miz was left out. As you’d imagine, Miz was irate and Bryan backed it up as he said Miz backed out of a clear rematch proposal from Ziggler last week and didn’t want anybody on his team who didn’t want to fight. Miz’s response geared towards Bryan’s demeanor on “Total Divas” as a whiner. Bryan slipped on the next line, but he basically booked an open challenge for Ziggler to defend his IC Title. Good stuff. – The WWE Intercontinental Championship match between Champion Ziggler and Curt Hawkins with Miz on commentary was literally about four seconds. This was Hawkins’ “long-awaited” debut as he mistakenly (probably on purpose) called it Atlantic City instead of Newark, New Jersey and made a bad “cranked necks” joke. He was soundly superkicked as Ziggler retained. We got some newsworthy stuff as Ziggler cut a promo that picked on Miz some more and brought up that he’d defend the belt on his own terms now at SS and challenged anyone from Raw to take him on. Miz was enraged, which was great, as we finally had something interesting for SS that could have future implications on the brands besides useless “bragging rights” bouts. – The backstage segment with Ambrose and Ellsworth pushed the main event some more, as the interviewer lady mistakenly called Ellsworth “James Ellis” (we’ll be amazed if she still works there) and it transitioned into another instance of Ellsworth trying to guilt Ambrose into letting him be at ringside, despite the clear rules that he couldn’t be out there. – The backstage segment with Wyatt, Harper and Orton was a follow-up to what we saw earlier, as we learned that Wyatt was initially skeptical, but welcomed his “snake-like abilities.” Orton said something about the devil in his ear and his eyes twinkled in a weird lame effect. Meh. At least they’re on the same page. – The Survivor Series Tag Team Qualifying match between The Usos and Headbangers also couldn’t have been more predictable, as an easy way to get the way-over Usos over to the SD side of things. Usual heel tactics made this one short, as they pulled on the “skirts” to win. They so done with that. – The backstage promo from Styles was more main event hype as he faked excitement for the match and mentioned that his primary goal was to eliminate Ambrose and this time there were no excuses. – The backstage segment with Ambrose and Ellsworth was one last push to the main event, only it resulted in Ellsworth outside of the arena by Ambrose, which seemingly wrote him off the show. Or so we thought. – The Ambrose-Styles main event where Ellsworth was banned from ringside and if Ambrose won, he’d become #1 Contender for the WWE World Heavyweight Championship was good as far as another one of their bouts was concerned. It’s hard not to be competitive about four weeks in a row, but they always change up one aspect of the bout to make it interesting. That, plus we expected Ellsworth to somehow get down to the ring by hook or by crook. The action was usual until the cameras turned on Ellsworth at ringside, much to Ambrose’s chagrin. He was chased away by Security briefly until he ran back to the ring, which separately cost Ambrose and Styles a pinfall. A few slick counters on both ends before Styles locked in the Calf Crusher, which Ambrose got to the ropes at the last moment. Ellsworth was back at ringside, before Styles wiped him out with a lariat over the announce table. With it seemingly in the bag, Styles went for the Phenomenal Forearm and headed into a Dirty Deeds to end the bout and declare Ambrose official #1 Contender once more. The twist by the end was that Ambrose was happy with the developments and even embraced Ellsworth on stage by the end, despite Ellsworth being on the floor, held up by a few security guards. Funny. Surely, Styles will find a way to dispute this and it’ll be fun to watch the story develop more next week. Posted on December 26, 2016, in WWE and tagged AJ Styles, Alexa Bliss, American Alpha, Baron Corbin, Becky Lynch, Bray Wyatt, Carmella, Curt Hawkins, Daniel Bryan, David Otunga, Dean Ambrose, Dolph Ziggler, James Ellsworth, JBL, Kane, Luke Harper, Maryse, Mauro Ranallo, Naomi, Natalya, Nikki Bella, Randy Orton, Shane McMahon, Survivor Series, The Headbangers, The Miz, The Spirit Squad, The Usos. Bookmark the permalink. Leave a comment.